I have made an very important decision: am going to revive a well-loved segment of my blog, Ask Dr. Rob. OK, perhaps "well-loved" is a bit of hyperbole; it would be more accurate to say "well-tolerated with liberal use anti-emetic and antipsychotic medication." I can live with that. Still, I am going to give this segment a metaphorical sharp blow to the chest and a few shocks with the paddles to get it up and running again. The goal of this segment is to answer questions my readers have regarding the wonderful world of medicine. Before you get all excited about having questions answered, I have to warn you that some of my answers are given with very liberal use of my creative license. The creative police have threatened at times to suspend that license. No wisecracks about learner's permits. If you have questions you want answered (whether or not you are fictional), send your questions to more.distractible@gmail.com. Dr. Rob: Long-time reader, first time writer! I want to know why it is that my doctor makes me pay to get my own medical records. It seems like since they are my records, they should be free to me! Can you explain this to me? This image of Hippocrates bears a striking resemblance to the famous starship captain Jean Luc Picard, a fact that will be noted by many future historians. Historians are (will be) unsure, however, if Hippocrates ever referred to any of his assistants as "number one" or ever uttered the words, "make it so." "When a person has been cured of chronic hemorrhoids, unless one be left, there is danger of dropsy or phthisis supervening"
"Hiccup supervening in dropsical cases is bad." These quotes (which my mom used to tell me when I was a wee pup) are what we have from his observations regarding patients, i.e. his medical records. The purpose of these records was not for the care of the individual patient, but for the furthering of medical science. Which brings us to the first fun fact about medical records: They are a place where observations are recorded. Fast forward a thousand years or so and we come to, what many diseases refer to as their "golden age:" the middle ages. It was, in fact, a really good time to be a bacteria, virus, or other pathogen. Humans, on the other hand, were the "Cancun spring break of germs" - a place where infectious organisms could live out their adolescent fantasies, living their germ lives without restraint and without thoughts of the future. The middle ages were the pinnacle of "germs gone wild." "Bob, Judy, Sarah, Billy-Bob, Peggy-Sue, Enoch, and Archibald died today." "Ed, Edith, Tony, Frank, Zippy, Polly, Buffy, and Samantha got growths on their heads today." You get the picture: not much need for record-keeping of the daily parade of death and disease. So Medieval doctors turned their sights to something different: intervention. This fascinating picture depicts the fun times of the madcap middle ages. 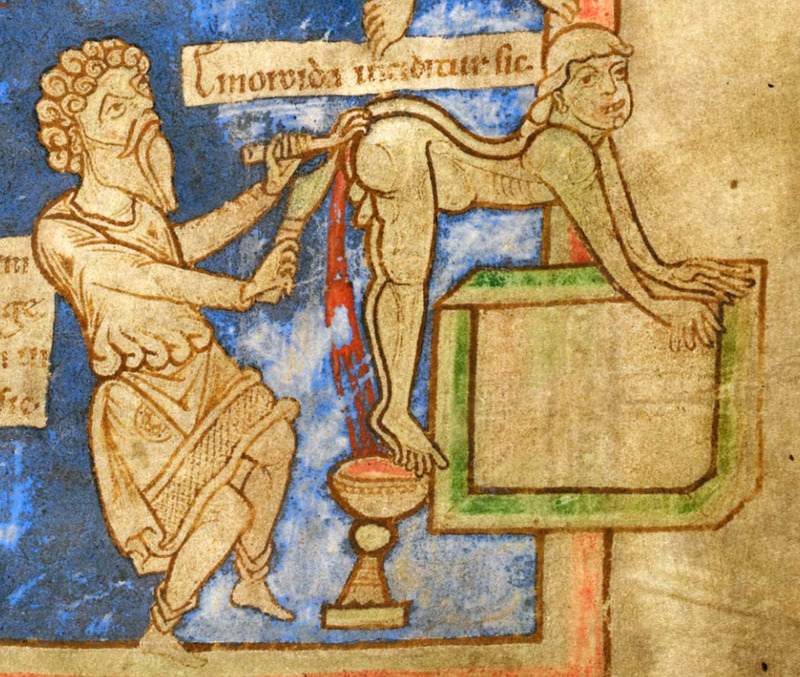 Note the grin on the face of the patient getting the "sword and claw" treatment for hemorrhoids. Those were the days. The middle ages were the time when surgeons took to the forefront in the battle against disease, literally wielding lances, torches, knives, and swords against the armies of disease and pestilence. Which brings us to the second fun fact about medical records: They are a place where interventions are recorded. This continued (in varying forms) for many generations until around the end of the 19th century, when doctors were finally given effective weapons against Joe Germ and Tommy Tumor: science. Instead of wielding swords, knives, and torches, doctors brandished microscopes, medications, and peer-reviewed studies. Physicians were not observers or technicians as they had been in the past, they became keepers of the "secret knowledge" of medicine: high priests in the sacred halls of science, bringing high scientific knowledge to the wretched masses. I was not aware that Laurel Aitken was the high priest of Reggae. I was not aware music styles had clergy. Is Kenny G the high priest of elevators? Diseases began to have cures, and the halls of medicine became sacred temples where people could be saved. Within medicine evolved a clerical hierarchy where specialists became elevated above generalists, and large referral hospitals (Johns Hopkins, Mayo Clinic) became the great temples where the greatest power resided. Medical records became sacred documents too. Doctors still recorded observations and interventions in these records, but began to use them as a place to plan the cure and consult those with more knowledge when that plan was not evident. Which brings us to our third fun fact about medical records: Doctors view medical records as their property, where their plan to heal people can be kept. The "golden age" of medicine, where doctors were revered by the yearning masses was pre-empted by a small detail: money. All of this mystical healing that was going on in the sacred halls of health care began to stack up bigger and bigger bills. Hippocrates and Marvin the Medieval Doc didn't have big bills because they were simply observing and doing small interventions. But modern health care was complicated and expensive and had to get paid for. This ushered in a new era of care: the insurance era. Third-party payors, funded by business and government became the wires through which the currency to pay for care flowed. By accepting money through these wires, doctors unsuspectingly handed control to those controlling the wires. This became clear once the cost of care became burdensome and in need of "management" (i.e. to cost less). To access money to pay for care, doctors had to demonstrate the care given was worth payment. This demonstration happened via, you guessed it, the medical record. Payment was made in exchange for two things: documentation and codes. With the involvement of the government in this transaction, records became increasingly complex, and failure to comply with this complexity was considered "fraud" on the part of the government. That's our fourth fabulous fun fact about medical records: Their main purpose is to justify payment. Share information (and cats) with nearly anyone. So when applied to the increasingly complicated transaction of health care, computers seemed to be the perfect solution. Doctors could generate all the coding and note-taking requirements the insurance companies wanted with minimal effort. But things are never as simple as they seem, and so once the payment bar became easier to get over, it was simply raised, requiring eve more information and codes. Furthermore, the ability to organize and share data was used to add a new requirement for payment (under the innocent sounding name, "meaningful use"). Computer generated notes became bloated by algorithm-generated words and codes. Payor required data become the new commodity for which doctors were paid. So, the final fun fact about medical records is: They have little to do with patient care. They contain the doctor's observations about the patient, some of which could be embarrassing to the patient, and others which could make the doctor look dumb. Either way, the docs would rather not have patients looking at them. They contain all the procedures that were done. Doctors are afraid that patients will see this and ask difficult questions about the interventions, like why were they done, and why didn't it work? Doctors feel that the record is the place for their special knowledge and information. Hence, things are written in a way that is difficult for anyone to understand (which makes them seem smart). Read any radiology report for an example of this. Since records are meant to justify payment, they are largely financially-motivated and not clinical documents. This means that they don't do real well when it comes to understanding the two things patients want to know: what's wrong with me, and how can I feel better? Computer generated notes are enormous in size but very small in useful information. So, Lucy, consider it a blessing that your doctor doesn't release the notes without the required ransom. They are not really about you, and they are not really going to be of much use to you anyway. "As to diseases, make a habit of two things — to help, or at least, to do no harm."